At our Coin Mint, have a go at striking your own replica Viking or Saxon coin, and learn a little about how money was used, what it could buy and the penalty for stealing! At our stall you can mint up to four Viking Age coins. The second coin is has faces from two different coins minted at around the same time (940s AD). The obverse is the raven banner of Olaf Sihtricsson, a Viking warlord who controlled Northumbria. Again, around the outside is our custom makers mark 'TYRSLIþ BLA RAF.' 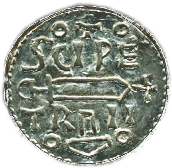 The reverse of the coin is referred to at 'Saint Peter's Coinage' as it bears the inscription 'SCIPE' which is abbreviated Latin, for 'Sancti Petrus Moneta', St Peter's Money. Below the sword is a Thor's Hammer motif that shows the cultural mish-mash of Scandinavian pagan's and Anglo-Saxon Christians in the Northumbria of the tenth Century. 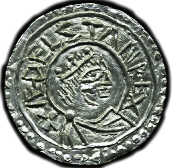 The third coin is that of King Cnut, whom in addition to being King of England, became King of Denmark and Norway in the early Eleventh Century. The Obverse is a profile of the king with the legend 'CNUT REX.' The reverse is a long-form crucifix, perhaps to help the cutting of a penny to make halves and quarters. The inscription reads 'GRUNAL ON BED' the maker of the dies. The Last coin is that of William of Normandy and dates from around 1070, a few years after the conquest. He is shown in profile flanked by two sceptres, a badge of kingly and godly power. The inscription reads '+PILLELM REX' The reverse has a short cross and a makers mark. The Viking-Age peoples traded using the value of the material or goods they wanted to sell or buy. The value of a good milking cow, or an amount of butter or grain was their point of reference when bartering. However, if you wanted to trade your cow for some grain, but couldn't find anyone with iron who wanted a cow, then you'd need something else. Valuable precious metals, usually silver but occasionally gold, could be used in their place as unit of payment. Silver coinage from far flung places such as Afghanistan could easily be used in places such as Dublin in Ireland, or in York, Northumbria. Several Viking hoards have been found containing Islamic Dirhams, English Pennies and Frankish Deniers amongst others. Coins weren't the only valuable silver trade good however. Many hoards contain silver bands of 'hack silver' where slivers of metal were cut from a bracelet to make the weight of a trade, and there are many examples of ingots - trade weighted bars - in Viking hoards. Similarly, silver and gold jewellery fragments have found to be deliberately broken for this reason, as have coins (half pennies, quarters or farthings etc). Silver was very valuable, so it's unlikely that it was used to buy mundane things where a barter culture better served. More likely would be large trades of animals, grain, weapons and land. The English penny of the late Saxon period in today's money would be worth around £30. A full arm ring - many times the weight of a penny - would be incredibly valuable. The Vikings particularly liked to show wealth, and powerful lords bestowed silver arm-rings on their bondsmen, as both payment and prestige. The primary precious metal found in hoards is silver. Many items, particularly coins, bare marks of testing processes used by traders. Without the aid of modern science they relied on knowing the feel of good silver. Cuts into the edge of coins called 'nicks,' and 'pecks' onto the surface of the coin test to see if the coin is merely gilded (plated) over a base metal such as lead or copper - or a copper/silver mix. Bending the coin would also show if it was made from silver as it is considerably harder to do so than copper. As well as showing the extent of kingly or national power, especially in the control of wealth generation and taxation, coins can show how money travelled. Certainly in the case of Islamic coins found in Britain, they show how the trade routes through Russia and Scandinavia reached Britain and Ireland, especially in the tenth century when Viking power was building. 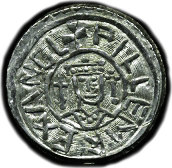 The English silver penny was introduced around 765 AD and persisted until the 13th century. 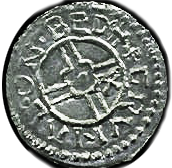 During the late 9th century, until the mid-late 10th century there was a round half-penny, but after currency reform by King Edgar in 973 AD people were required to cut the coin in half or quarters (usually following the cross on the reverse). During King Edgar's reign, the number of mints stabilised and the die patterns were controlled centrally at a master die cutting workshop. Later there were 5 such workshops. 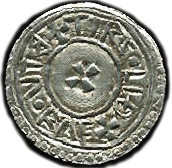 The Domesday Book mentions that owners of a Mint would have to travel to London and pay a Monetagium (tax), as well as buy new dies quando moneta vertebatur (‘when the coinage was changed’). 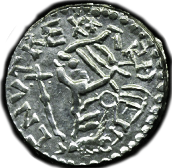 Some coins, such as those minted at York, (Viking Kings' Ragnald, Sithric etc) show how the Vikings were embracing Christianity. 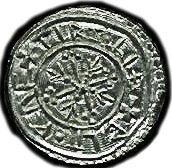 Several coins bare the symbol of St. Peter (sword) who was the patron saint of York Minster. Included on the face of these coins is also the hammer of Thor, the Viking God of Thunder. Linking St. Peter to such a popular god in the Scandinavian pantheon was a sensible move in the conversion and assimilation of Vikings into Christian Europe. Ingots were beaten into thin sheets under heat and coins were cut from it with a circular chisel. The dies were made of iron with the pattern punched into it. 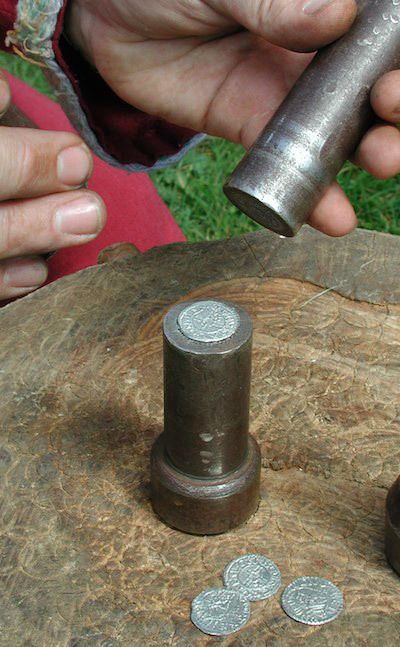 The coin is placed between the two dies and the pressure exerted by hammer blow causes enough friction to melt the silver for enough time to dip into the punched pattern and create the relief. In The time of Alfred the Great there were few mints, mainly in large population centres like Winchester. 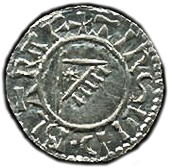 By the time his grandson Athelstan became 'Rex Totius Brittanae' in 927 there were numerous mints around the newly unified country and 8 in London alone. By the reign of Aethelred II (978 AD) there were around 90 mints. This shows just how the Wessex power base had spread and how much wealth was being generated in trade with the Viking settlers and the rest of Europe. For matters concerning payments to the crown, this line of Saxon kings had enough power to refuse foreign currency in internal affairs. Minting official coins was heavily regulated and there were severe punishments for forgery, and clipping (stealing excess silver). Punishments included having hands cut off and being castrated. 15. Thirdly: that there be one money over all the king's dominion, and that no man mint except within port. And if the moneyer be guilty, let the hand be struck off that wrought the offense, and, be set up on the money-smithy but if it be an accusation, and he is willing to clear himself; then let him go to the hot-iron, and clear the hand therewith with which he is charged that fraud to have wrought. And if at the ordeal he should be guilty, let the like be done as here before ordained. In Canterbury seven moneyers; four the king's, and two the bishop's, one the abbot's. At Rochester three; two the king's, and one the bishop's. Else, at the other burhs one. Articles on this site are predominately aimed at children and teachers reading for their Key Stage 2 'Invaders' Syllabus. However, we aim to make sure our articles are accurate and up to date. Below is a list of reading for any budding expert on the subject. If there are any queries about, or possible corrections, for any of our articles please contact editors@vikingsof.me. Article by Alan Kael Ball, 2013-09-06 , updated on >2016-01-06 .